Mitch Sumner prepares to fire a pitch to the plate at Northmont. Sumner worked 5 and 1/3 innings, allowed one hit, struck out eight and issued only two walks. Nolan Frisk dives back to first base in the top of the 6th inning at Northmont. 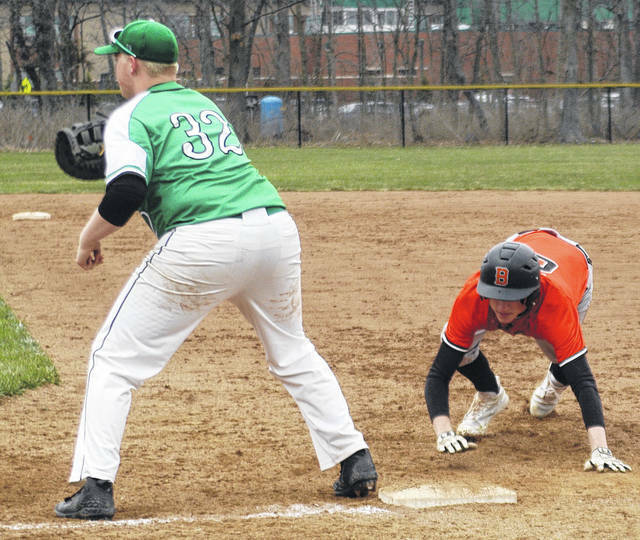 CLAYTON — After taking a 1-0 lead Friday at home vs. Beavercreek, the Northmont Thunderbolts saw the Beavers bounce back to tie the game 1-1 in the top of the 3rd inning. Beavercreek went on to post a 3-1 victory. Northmont took a 1-0 lead in the bottom of the second inning when Keaton Kesling drew a lead-off walk, stole second and scored on a single by Brenden Siehl on a 2-1 count. Beavercreek answered in the top of the third when Nick Brown hit a double and advanced to third on a passed ball. With two outs Jake Elmore singled to bring Brown home with the tying run. After that Northmont never really mounted much of a scoring threat. The Thunderbolts got a base runner on board in the bottom of the 5th inning via a walk and got a single from Justin Combs in bottom of the sixth, but that was it. 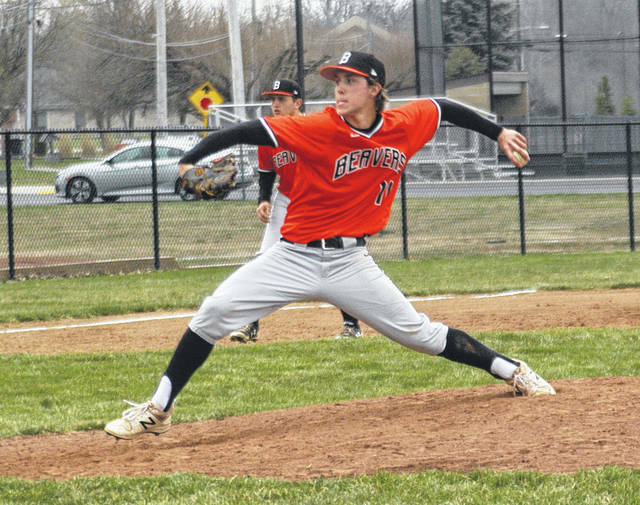 Beavercreek’s pitchers kept the ball low in the strike zone and effectively silenced Northmont’s hitters the majority of the game. Starting pitcher Mitch Sumner worked 5 and 1/3 innings, allowed one hit, struck out eight and issued only two walks. Charlie Schafer came on in relief for the final 1 and 2/3 innings, allowed one hit and struck out three. Northmont pitcher Jason Kohr pitched all seven innings, scattered five hits, struck out two with no earned runs. The Beavers took the lead in the top of the 6th inning thanks in part to a pair of Northmont fielding errors. Lead-off hitter Nolan Frisk reached base on a error at second. Jake Elmore got on board via an error when the shortstop uncorked a wild throw to first to enable Frisk to score with Elmore advancing to second. With one out Clay Cash singled between third and short to score Elmore to give Beavercreek a 3-1 advantage. With the victory Beavercreek improved to 6-1 overall and 3-1 in conference play while Northmont fell to 1-5 overall and 0-1 in conference play. Kincaid admitted his players struggled with Beavercreek’s pitchers keeping the ball low in the strike zone.